Acknowledged author Elaine N. Marieb wrote Human Anatomy & Physiology (10th Edition) (Marieb, Human Anatomy & Physiology) comprising 1264 pages back in 2015. Textbook and etextbook are published under ISBN 0321927044 and 9780321927040. 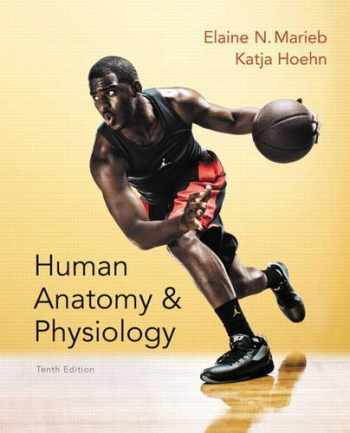 Since then Human Anatomy & Physiology (10th Edition) (Marieb, Human Anatomy & Physiology) textbook received total rating of 3.5 stars and was available to sell back to BooksRun online for the top buyback price of $13.84 or rent at the marketplace. NOTE: You are purchasing a standalone product; MasteringA&P does not come packaged with this content. If you would like to purchase both the physical text and MasteringA&P search for ISBN-10: 0321927028/ISBN-13: 9780321927026 . That package includes ISBN-10: 0321927044/ISBN-13: 9780321927040 and ISBN-10: 0133997022/ISBN-13: 9780133997026. MasteringA&P should only be purchased when required by an instructor. For the two-semester A&P course. Setting the Standard for Innovation in A&P Human Anatomy & Physiology has launched the careers of more than three million healthcare professionals. With the newly revised Tenth Edition, Marieb and Hoehnintroduce a clear pathway through A&P that helps students and instructors focus on key concepts and make meaningful connections. Each chapter opens with a visual “Chapter Roadmap” that guides students through the material and shows how concepts are related within and across chapters. The new modular organization makes key concepts more readily apparent and understandable to students, and new videos help students see why the content matters in their course as well as their future careers. As students master important concepts and follow a clear path through chapter content, the expanded suite of learning tools in the book and in MasteringA&P ensure they don’t get lost along the way. Also Available with MasteringA&P ® This title is also available with MasteringA&P – an online homework, tutorial, and assessment program designed to work with this text toengage students and improve results. Within its structured environment, students practice what they learn, test their understanding, andpursue a personalized study plan that helps them better absorb course material and understand difficult concepts. Students, if interested in purchasing this title with MasteringA&P, ask your instructor for the correct package ISBN and Course ID. Instructors, contact your Pearson representative for more information.